1. Cut prints into 5x5 squares. 2. Drill a small hole on the top of each piece of slate. 3. Attach photos to the center of the slate squares using spray glue. Press gently to secure. 4. Spray finished piece with clear polyurethane. 5. 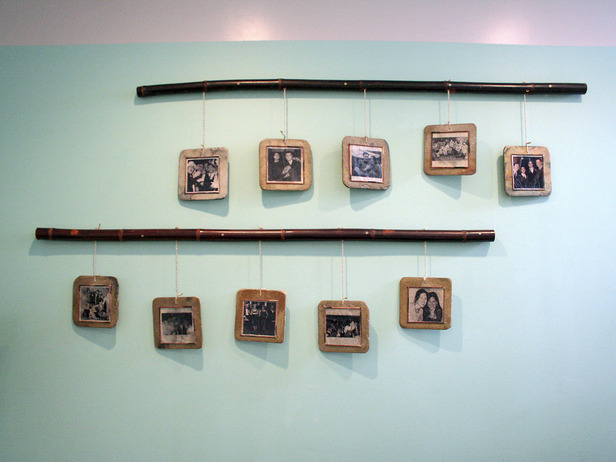 Use hot glue to frame out each picture with wood dowels.
. Leave enough slack to tie to the bamboo. 7. Drill evenly spaced holes in the bamboo rods. Thread the twine through the holes and knot. 8. Secure entire piece to wall studs.